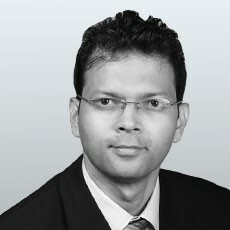 Dr. Milind Sabnis is the Director of the Healthcare Practice at Frost & Sullivan, Asia Pacific. He has over a decade of consulting experience engaging global clients. He has advised top pharmaceutical companies, hospital groups, and ministries on market entry strategies, product lifecycle management, and marketing strategies. While with the World Health Organization, he developed and successfully implemented various strategies to stop Polio transmission in one of the 3 high risk regions in the world. He holds a Master in Business Administration from the University of Cambridge, United Kingdom, a Doctor of Medicine specializing in Preventive Medicine from the University of Mumbai, a Bachelor of Medicine and Bachelor of Surgery from the University of Mumbai.